Naiive. Young. Not willing to listen to advice. 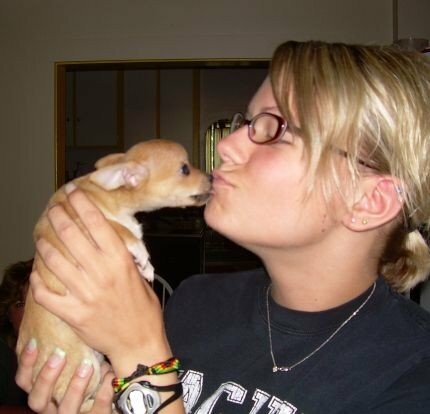 And that one time, I had major puppy fever. So, I did what any non-sensible girl would do. A chihuahua, to be exact. Moxie was, in one word-- presh. So, so presh. All 1 pound of her. I loved giving her little kisses. I left Moxie at home while a friend was over. and broke every single bone in her tiny foot. I think said friend may have been lying. completely shattering her little paw. It was at that time that I realized I was in over my head with this little fuzzball. and I was also on the Boise State Cheerleading team. So, this one time, I decided a puppy was not a good idea. Thankfully, my aunt came to the rescue. She adored miss Moxie and took her right in. I went to visit little Moxie. and notice how incredibly bad her breath smelled. Moxie is going to be 5 this year. She's a fuzzy, kissy, sassy little lady. give her all the puppy love she deserves. just direct me back to this post. Oh, Moxie. What a sweetie. I got in trouble with puppy fever once... and didn't learn my lesson. Then I had a baby! I'm glad you were able to find someone to look after her and this way you get to visit her too! I am in LOVE with Moxie! She is so cute. I love little dogs. I have a pomeranian and it's my 2nd one. They are such great companions! awww Moxie is so cute! Love the photos, Moxie is so sweet! Moxie is SOOOOOO super cute! I'm glad that your aunt took her in and gave her a great home. I didn't know you did this link up!! Yay!! I just added your linky button to my side bar. Your puppy is precious. Very cool that you still get to see her. Awww! I'm glad you made the right choice for HER and that you kept her needs in mind! 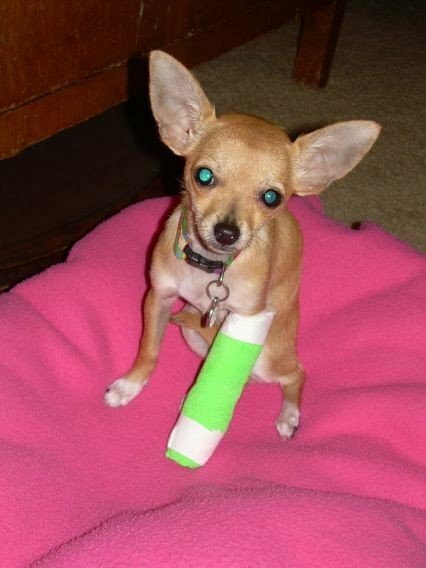 Cute doggie cast!! Never seen one before. Aw, Moxie is adorable!! I'm glad she had a happy ending. I had anxiety the whole time reading your post until you told us your Aunt took her in... I have the biggest heart for animals... especially puppies. Have a great weekend, Aunie! So presh! And i think that 'this one time' you got to show how responsible you really were!! And bonus that your aunt stepped up and you still get to visit and exchange kisses!! Aww this is soo sweet! My brother went through something similar but very different at the same time with his bird. Moxie is sooo cute! Ah Moxie is sooo cute! I am glad that she is able to be with a lovely family who can love her just as much as you did! I love my pup, but I know what a handful they can be! p.s. why was her little cast, the littlest I think I have ever seen, the saddest, but cutest thing I think I have seen today?! Happy weekend girlie! And love your new buttons and blog design!! She's adorable! have a good weekend. Gosh,all of these pictures are SO cute!!! I love this bittersweet post - I'm so glad you found Moxie a great home. My name is Georgina and I'm your newest follower. Oh no....she is so adorable. I would love to have a little dog. However, I think at this point in life I'll have to refer myself back to this post as well haha! So cute. I've had puppy fever for 32 years. Brent says I can get one when we buy a house with a yard. So glad moxie now lives somewhere where you can still visit. aw! so so cute! I get puppy fever ALL THE TIME.